Happy new year! I haven’t posted much on the YLHelp blog recently. I’ve passed along most of my ideas and resources on Instagram (@ylhelp) and Youtube (youtube.com/smcgever). But, I also (finally) finished my PhD in Historical and Systematic Theology (it is strange to be called Dr. McGever now – my GCU students think it is normal, my YL club kids give me a hard time about it – as they should haha). Anyway, with that finished, I’m hoping to shift back some of my spare time to share more resources to free up YL leaders to spend more time in relationships (especially some writing projects in the works). We also did a “YL’s Got Talent” Club which was fun. We promoted it for about six weeks and kids signed up to show off their talents (mostly musical). You really don’t need a plan to run it. I’d suggest giving it a try! 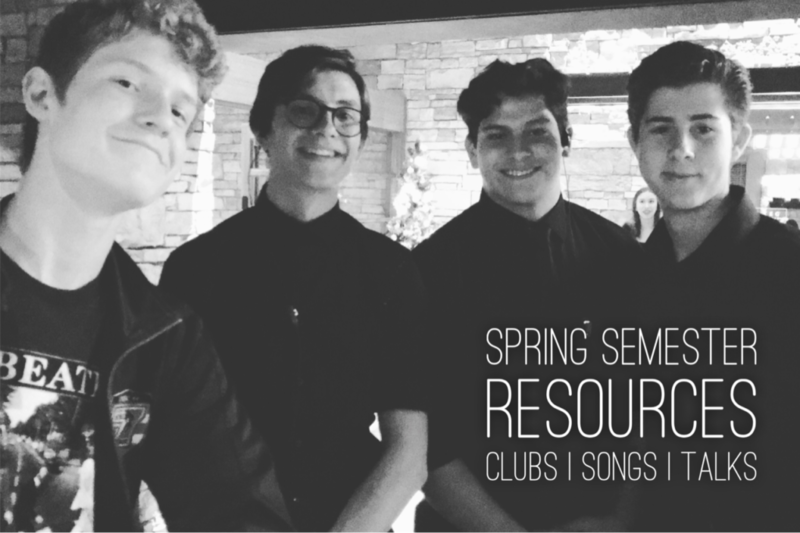 This semester we have plans for a few new clubs: LaCroix Club, Queen Club, Bob Ross Club, Super Mario Club, Sponge Bob Club, Seis de Mayo Club, and a few others. We have plans for them, but I want to see how they go first – some might be duds! This year my club has been going through the Gospel of Mark. You can find a ~10-15min “Talk Tuesday” video and one-page download for each talk at ylhelp.com/talktuesday. For the Spring semester, we will be doing the “odd” chapters (e.g. Ch. 2, Ch. 4, etc.) for our club talks. Since Mark is the shortest gospel and the Spring semester is a bit long, we will be doing two stories/accounts from some of the chapters. You can see the plan below if you are interested! I’m a bit ambitious (often too ambitious), but here are a few things I’m thinking about that might make it to YLHelp one way or another (remember, Instagram is where I interact most often). Marco Polo leader highlights (HT Jeff Huber): I will be experimenting with the Marco Polo app for communication with senior leaders. This app allows you to send a video “voicemail” to a person or group. My initial idea is for team leaders to send a short recap, maybe a praise and a prayer request too, via Marco Polo to the other team leaders after each club. Thanks to Jeff Huber, my buddy and an RD in Spokane for introducing me to the app. Replacing Remind app (Verizon): You may know that I use the Remind app for a lot of group communication. You may also know that Verizon is no longer supporting text messages through it by the end of January 2019. Boo Verizon! I will be looking for a replacement. I think I might move to GroupMe. Old Testament overview in my campaigners: I have been eager to help students (and leaders) dive into the Old Testament more. I have outlined a series of Bible studies to do this in my campaigners. If it goes well, you will hear more about this. Tweaking our Work Crew training in my area: My co-AD Jorge and I will be experimenting with some additional online training for our local Work Crew training. Speaking at LC… Capernaum (yeah! ): I was thrilled to find out I will be speaking at Lost Canyon again this summer (Session2)! One of the weeks is all Capernaum – I’m humbled, excited, and eager to learn how the Lord will guide me. I will share anything that I learn with you all. Please send me anything that could help me (I need it)! Lunch clubs: I’ve been keeping my eye on the best practices of lunch clubs for a while. I’m eager to dig into this further. I think there are some real benefits and challenges to lunch clubs and I’d like to gather these for folks like me who want to learn about this tool in our YL toolbelt. I’m curious as to what a Seis de mayo club is? What does that look like? Thanks. Hey brother, do you know when your ChikFilA document will be finished? It seems to be missing some information on the right hand side. I really like the idea for this club! My junior leaders Gael and Javi had this idea for club, it should be fun! Get kids in teams of three. One kid in each group is the tortilla, one is the beans, one is the meat. When the music starts they need to all walk around and mix up. When the music stops the team of three needs to find each other and lay on the ground in this order: tortilla (bottom), meat (middle), beans (top). Repeat. This Year: Lessons I Learned (Part 3) PLUS… Contest Week 3!